There is a certain amount of expertise required when handling customer complaints in a hotel. Most of the time, the complaint comes to the hotel receptionist, who should have the skill and knowledge to handle it effectively. It is not necessary a complaint does always have to be voiced, It can also be unvoiced. Hence, hotel staff should be able to address both types of complaints. It is important to remember that the hotel exists because of the guests only and if guests no longer stay at the hotel due to dissatisfaction then there will be no hotel. A part of the front office’s responsibility is to serve the customer well and this is evident in the way they handle problem. 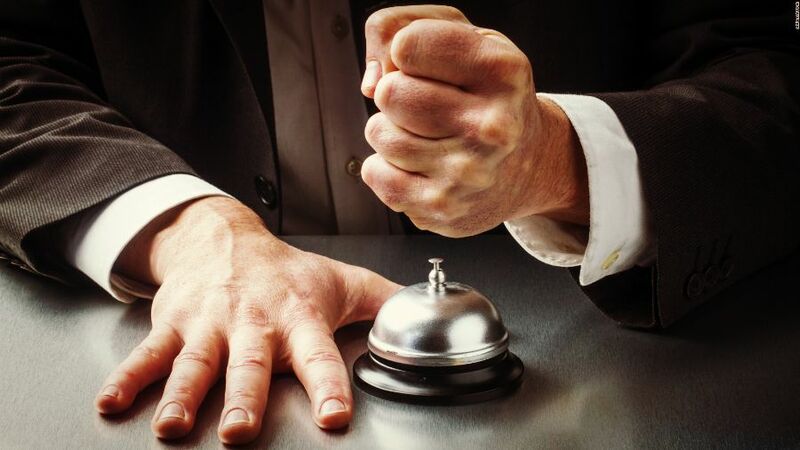 Here are some tips that will teach you how to handle customer complaints at your hotel effectively and ensure customer satisfaction. It is important that you give a patient ear to the customer while he is complaining and do not make an effort to interrupt. The customer is already angry and the interruption will cause his or her temper to flare even further. Allow the customer to describe, in detail, the reason for their unhappiness with the hotel or its service. The customer may yell and shout, but the front office staff should never take it personally. Instead the staff should concentrate on resolving the issue. While you can ask questions to understand the reasons better, it is important that you let the customer speak out his mind. Ask open-ended questions if you are not clear about the issue and this will show the customer you are genuinely interested in understanding their problem and resolving it. It will help the customer calm down and speak more coherently. As a receptionist, you should be aware of the difference between a genuine problem that requires solving and a situation where the customer is venting his frustration. So, listen to the complaint carefully to find out what is really troubling the customer. Hotels should never forget that the best way to advertise their service is through a satisfied customer. If a customer is dissatisfied, he will give negative feedback and bad reviews about the hotel and its services. This will have far-reaching consequences, as many customers now use online sites to provide feedback about hotels. Other potential guests read this and use it to base their decisions on whether to use the hotel or not. On the other hand, if a customer leaves the hotel satisfied, not only will he give positive feedback, he will return with friends and family the next time he is in town. Regardless of the customer’s race, language, appearance or culture, he or she should be treated with respect and made to feel valued and special. This should be throughout all departments of the hotel. When you respect your customers, you will make an effort to meet their needs, leading them to be satisfied. When dealing with an irate customer face-to-face or over the phone, it is important to be professional and courteous. Using a polite tone and demeanor will let you show the customer that you are making an effort to understand the situation and can help in defusing it. You should not show your nervousness, as this creates an impression of uncertainty and adds fuel to the fire. By being calm and confident, you will have a more positive effect. The fact that a customer approaches you should be an indication that he believes you will be able to help and resolve his problem. Also, handle the complaint positively. See it as an opportunity to improve customer service rather than taking it personally. Give your customers alternatives and suggestions if a particular service is not available. Try to convince the customer that you have made a note of their suggestions and show your appreciation by telling them that you will ask management to implement them as soon as possible. If you look at the situation or problem from the customer’s perspective, you will be able to better understand their frustration and/or anger. Even if you are not wrong or not part of the problem, it is important you issue an apology to the customer. The apology should be issued even if the customer is angry and yelling at the top of his lungs. Empathizing with the customer is a good way to handle customer complaints as it shows them that you understand what they are going through. It will help defuse the situation. As much as possible, you should try to resolve the customer’s problem. Remember, the customer has come to you with the hope that you can help them out. This is the time to show them that you are willing to aid them. Unless the situation is something you cannot resolve or address, avoid transferring the problem to another person but, If you do have to take the complaint to someone else then, stay on the call until the other person answers, first introduce the caller and transition the situation then after make sure that person understands the problem very clearly and is now full of aware the customer’s name and problem. Never blindly transfer an angry caller, if the call is forwarded to a voicemail box or gets disconnected, the customer will be more angry when they call back. Many times asking the customer to suggest an appropriate solution can go a long way in diffusing the situation. Also, if the solution is reasonable and you have the authority, you can immediately act upon it. If you do not have the authority, explain this to the customer and give him a time frame within which his problem will be resolved. If the customer gives an unreasonable solution, be calm and explain why the hotel cannot use it. Then give the customer an alternative to calm him down. It is important that you first apologize and then take action to resolve the customer’s problem. This transition should be seamless. Immediately after apologizing for the inconvenience caused, you should inform the customer of steps you will take to address his complaint and how long it will take. This is only possible if you listen to the customer’s complaint and understand it completely. Once a customer’s problem has been resolved, it is important that you follow up with him or her to find out whether he is happy with the solution. This will allow you to confirm that the problem has really been resolved and that the customer is now happy with the services of the hotel. A follow up also makes the customer feel special and this can make a huge difference in the overall impression that the customer has about the hotel. A follow up can build customer loyalty and pave the way to repeat business. The key to running a successful hotel is customer service. A big part of this is addressing customer complaints and ensuring that these complaints are resolved to the customer’s satisfaction. Successful resolution will have a positive effect on the customer, who will be more conducive to returning to the hotel in the future, as the way the complaint was handled and resolved makes the customer feel special and shows him that the hotel is genuinely interested in keeping its customers happy and satisfied.